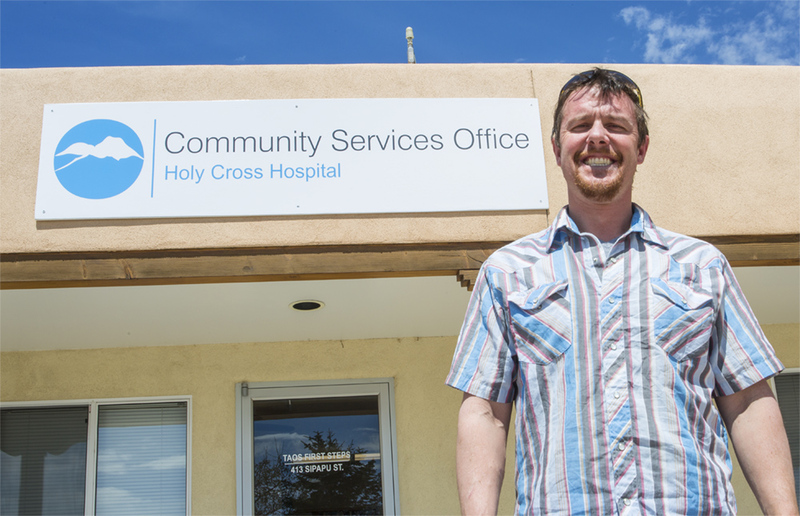 Jason Pfeifer, Coordinator, Taos Cancer Support Services, talks about their new partnership with the American Cancer Society, the 6th annual FOR THE HEALTH OF IT! 5k/10k race, walk and funrun (June 11, 2016), and his adventures in radio. Rolling Meadows, a suburb of Chicago. In three words (or more), what brought you to Taos? Taos Ski Valley. I was a ski bum looking for the next powder stash. How did you first become involved in the Taos Cancer Support Services (CSS) program? After being diagnosed with testicular cancer at 30 and not having many resources in Taos at that time, other than friends and family, I decided to start a support group. I was doing it on my own which was difficult to get the word out and keep it going. Then I got involved with Holy Cross Hospitals development and marketing department, at a time when they were looking to raise money to help with non-medical services for families experiencing cancer — such as paying for gas to get to treatment, food, massage, personal care, to name a few. This was when FOR THE HEALTH OF IT! was born. It’s a 5K/10K race, walk and funrun that takes place every June to raise money for the Cancer Support Services Program. I began helping with the event and providing support groups for the program. That has eventually led me to where I am today as the Program Coordinator. We are currently gearing up for our sixth annual FOR THE HEALTH OF IT! event on June 11th. How did the partnership with the American Cancer Society (ACS) come to be, and why was it important for them to bring these services to Taos? Getting to treatment is one of the most difficult pieces to navigate and pull together for cancer patients living in Taos and the surrounding area. We are excited about being able to not only help assist our patients by providing assistance with paying for gas, but to be able to find rides for them when they are unable to. I found out about this program offered by the ACS from someone who was a driver for the program in Houston and I thought, that’s exactly what we need and we do not have to recreate the wheel! I reached out to them and through my connection and work with Shirelle Besse, Program Manager, Mission Delivery for ACS, we now have a program up and running in Taos for the first time ever! We currently have 5 active volunteer drivers who are waiting their first ride request. We also have the Look Good Feel Better program. Look Good Feel Better (LGFB) is a free program that teaches female cancer patients how to cope with appearance-related side effects of chemotherapy and radiation treatments. My feeling is that if programs can be offered in Santa Fe or ABQ, there is no reason they cannot be offered in Taos. We just have to get the right people together to make it happen. How has the Look Good Feel Better program affected the women you interact with? The Road to Recovery program provides an amazing service to our community. how can individuals get involved and volunteer? To volunteer as a driver you simply contact the Cancer Support Services office at 575-751-8927. CSS is the coordinating agency for ACS in our area. If someone is requesting a ride, they contact ACS at 1-800-227-2345. In your experience, what is the most important advice to share with someone recently diagnosed with cancer? Reach out for support and accept support. Trying to handle the situation all alone can be unhealthy. People misunderstand that being strong doesn’t necessarily mean doing it on their own. Being strong is the state of mind we can choose to have during an experience with cancer. And we stay strong by building a network of friends and family that we can lean on. Support Groups are a great way to do that. Meeting others that are having or have had similar experiences makes one realize they are not alone and there is hope. Cancer Support Services offers a weekly support group Tuesdays from 5:00-6:30pm that is open to anyone affected by cancer. The group takes place at 413 Sipapu St. in Taos. You host a great show on KNCE 93.5FM! Can you tell us about your love affair with radio? I threw my hat in the ring to be a DJ on KNCE when the station first got started. I had never DJ’d, but was interested and thought it sounded not only fun but a good way to give back to the community — by being able to have guests on my show that are doing great things, and giving them a voice and opportunity for listeners to get to know them. I have been the host of ADHD Radio for almost a year and a half with my co-host, Todd-Allmighty, Wednesday mornings from 7-9 am. Folks may know me as JP Fresh! Tell us about FOR THE HEALTH OF IT! Mark your calendars for our sixth annual FOR THE HEALTH OF IT! event: June 11th, 8 am at the Youth And Family Center! This is our biggest fundraiser of the year, and it provides the financial support that we use to assist our clients throughout the year. Learn more about the program and sign up for the event at www.TaosHealth.com. If you are interested in becoming a sponsor or volunteering, please cal the office at 575-751-8927. 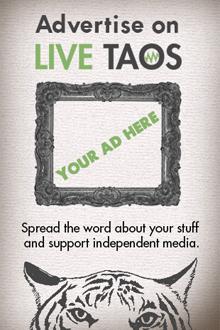 Kevyn is a lover of music and co-founder of Live Taos. His fondest memories are those of warm summer evenings drinking with his kittens.